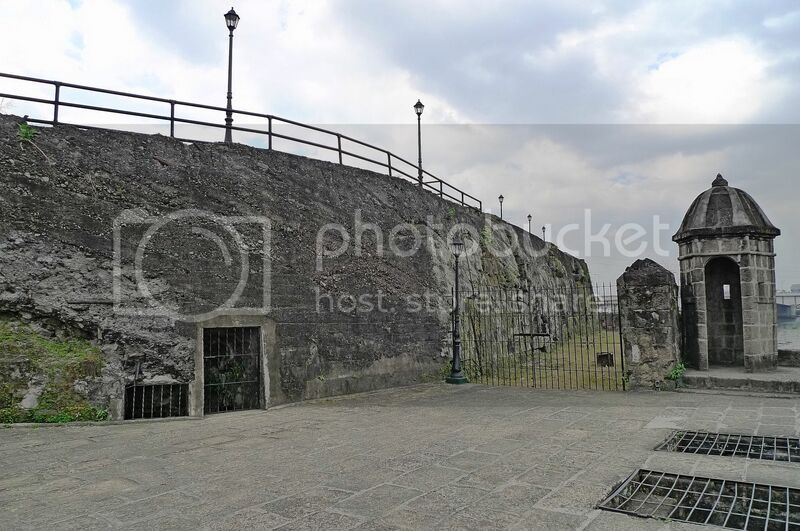 The main entrance of Fort Santiago looked imposing as it towered some 34 feet above me. I like the carvings at the top of the entrance. 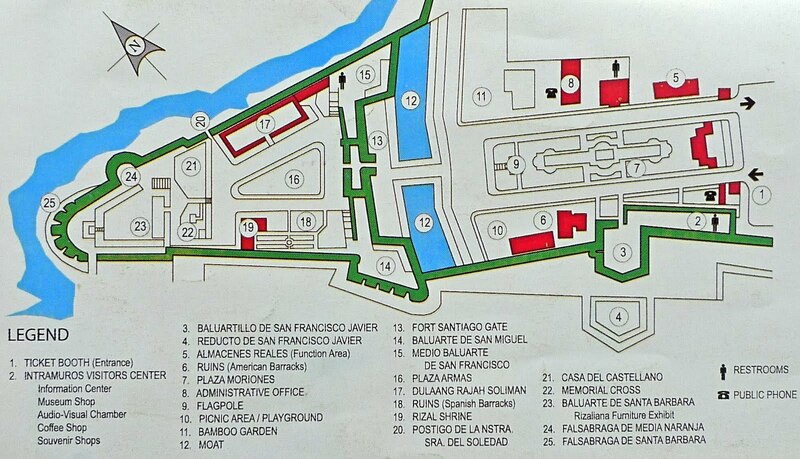 From the Visitors Centre that I went to earlier, I managed to obtain a map of Fort Santiago. Please click on the map below to enlarge it. 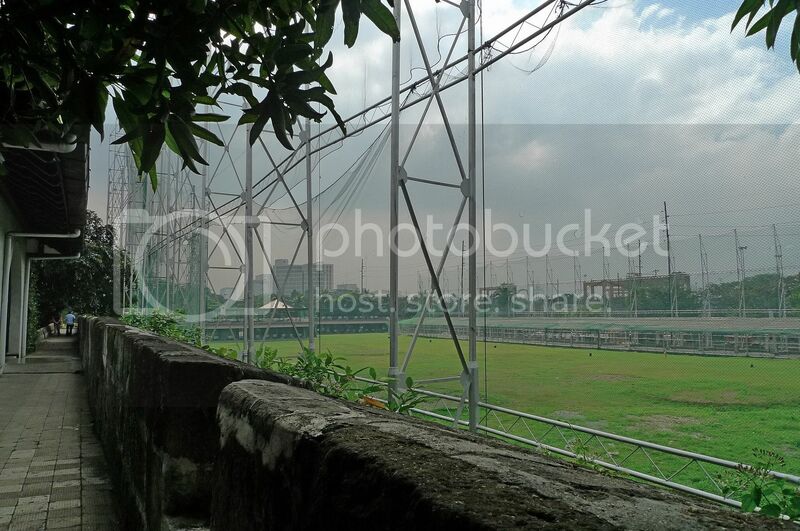 Can you locate the Fort Santiago Gate where I was standing with the moat behind me? 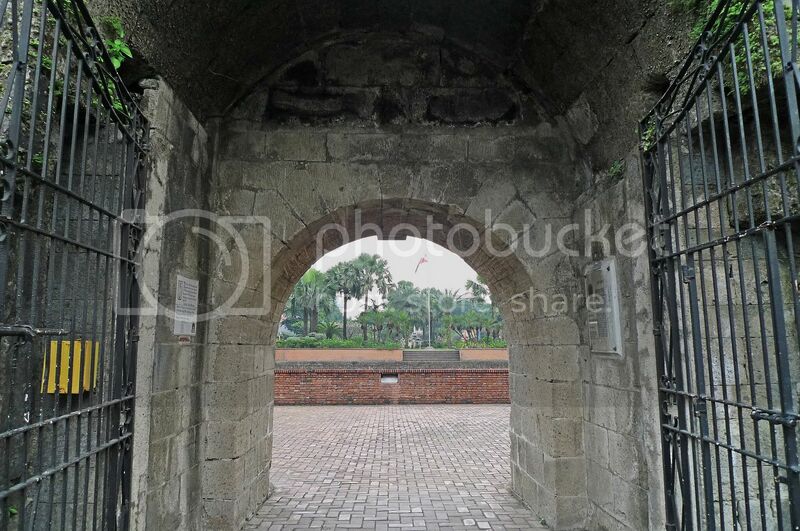 Fort Santiago was heavily shielded with tall, thick walls measuring about 22 feet high and 8 feet thick. 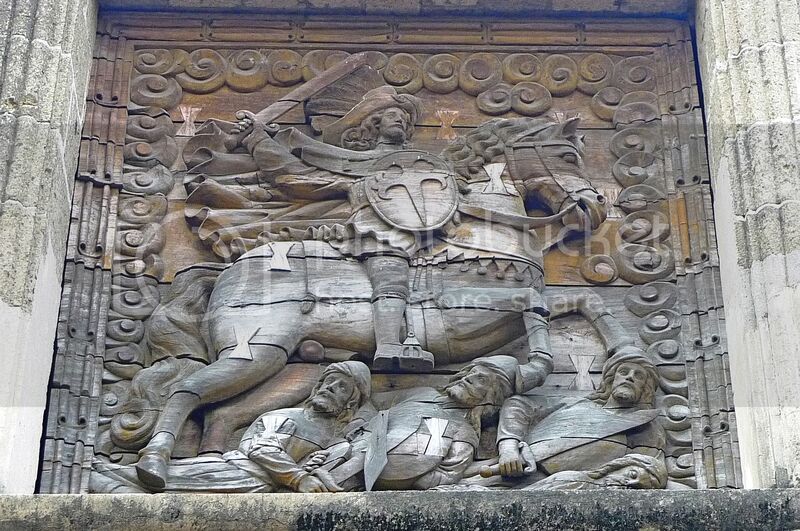 Yet when it was first built in 1571, it was made of wood and dirt until it was destroyed during the Spanish-Chinese war in 1574. 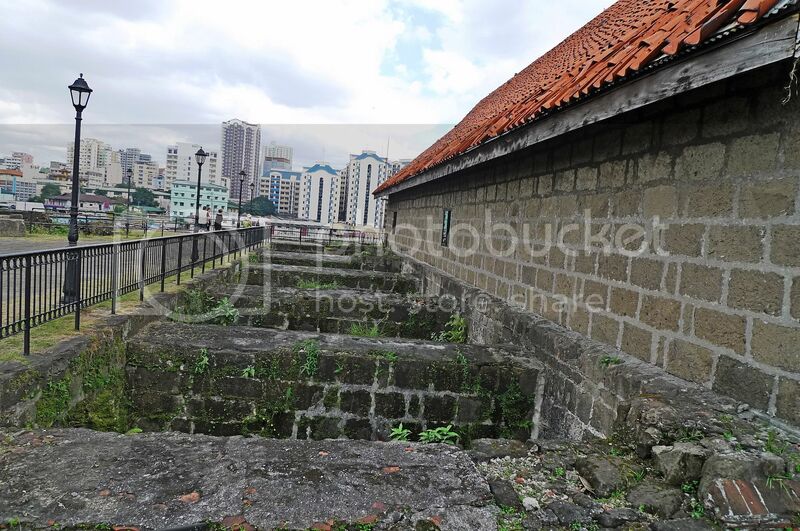 It was later rebuilt in stone but was heavily damaged during the Battle Of Manila in 1945. 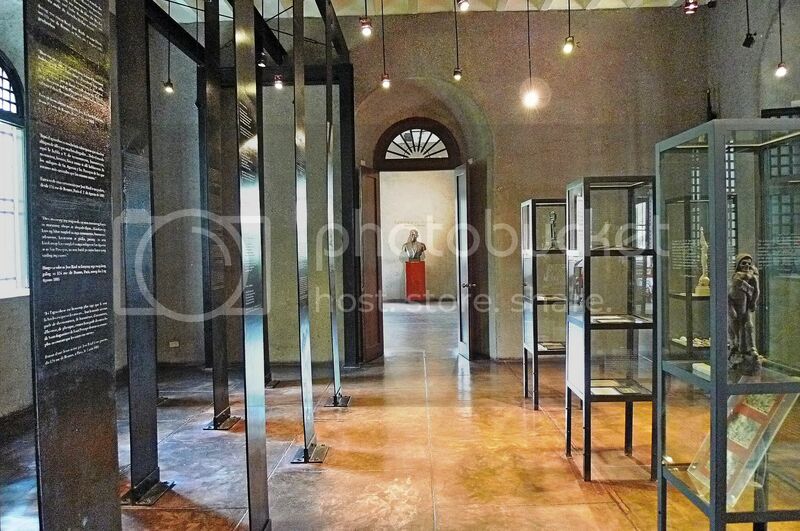 During the 1980s, it was restored by the Intramuros Administration. 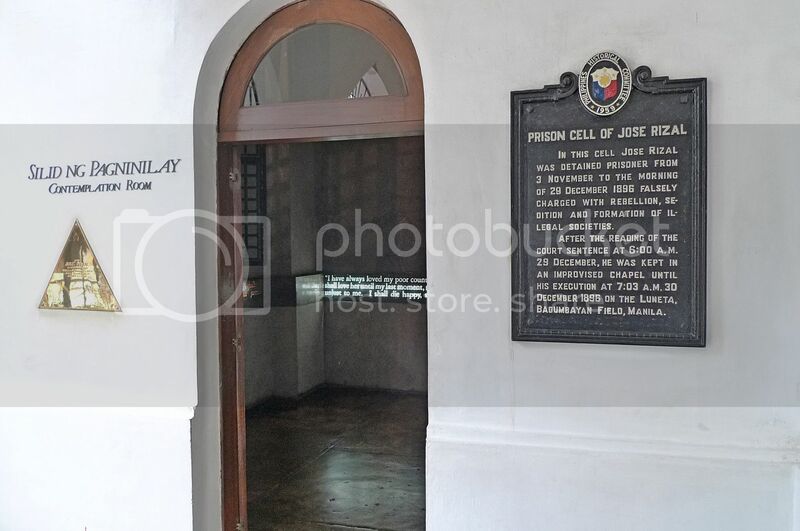 Today the fort serves as a museum which houses well-preserved legacies of the Spanish government, the Rizal Shrine, and the prison dungeons for criminals used by the Spanish officials. As I walked through the arch entrance, an expansive lawn came into view. 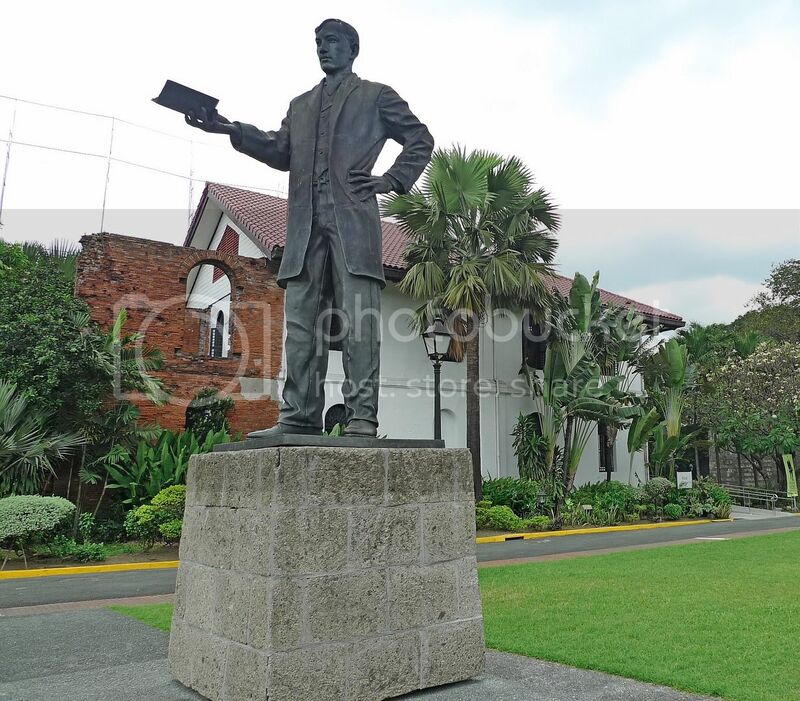 Standing at the far end of this lawn called Plaza Armas was a statue of Dr. José Rizal, the national hero of the Philippines. 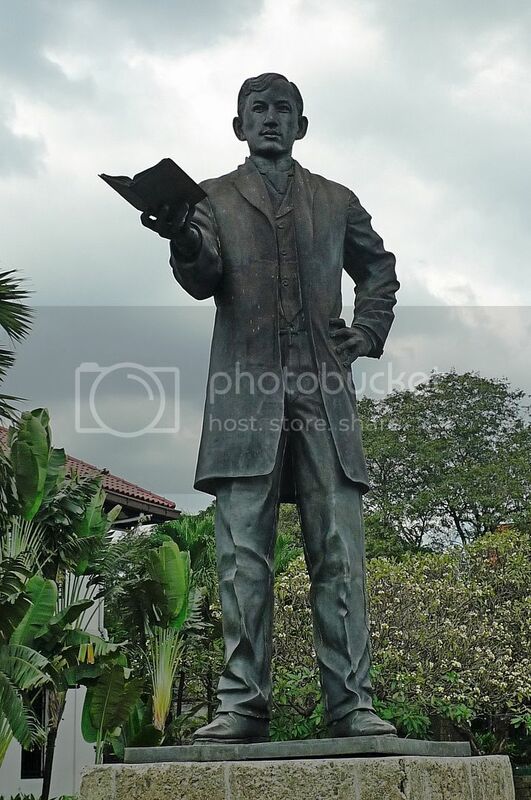 José Rizal was a prominent advocate of reforms during the Spanish colonial era in the Philippines. 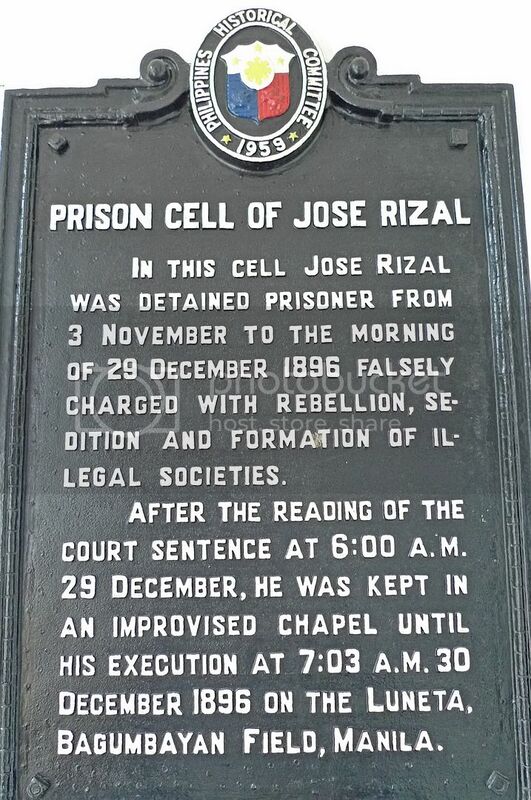 His military trial and execution in 1896 made him a martyr of the Philippine Revolution. 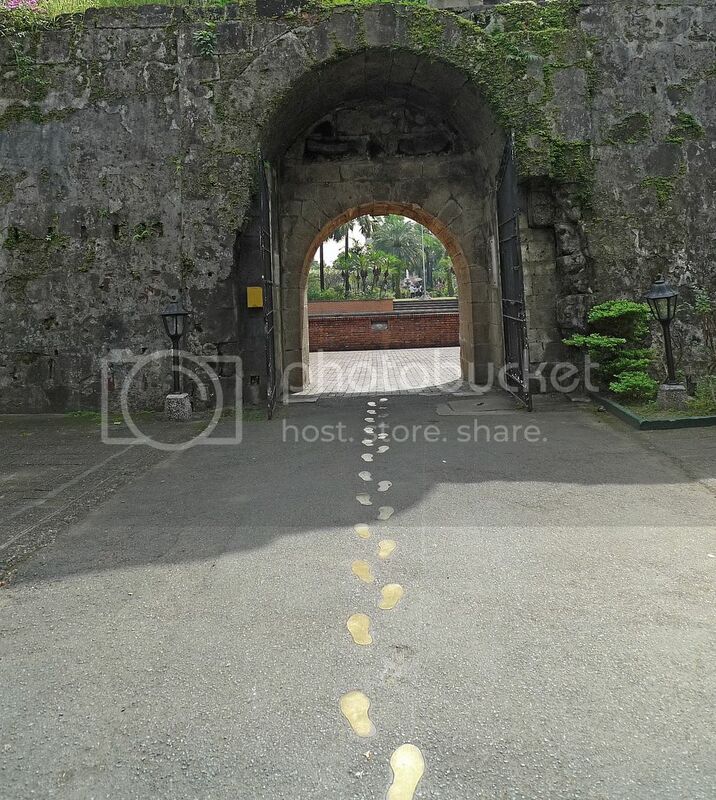 These footprints showed the path of José Rizal as he was taken from his dungeon in Fort Santiago to his final execution at the killing fields in Bagumbayan later known as Luneta and now renamed as Rizal Park. 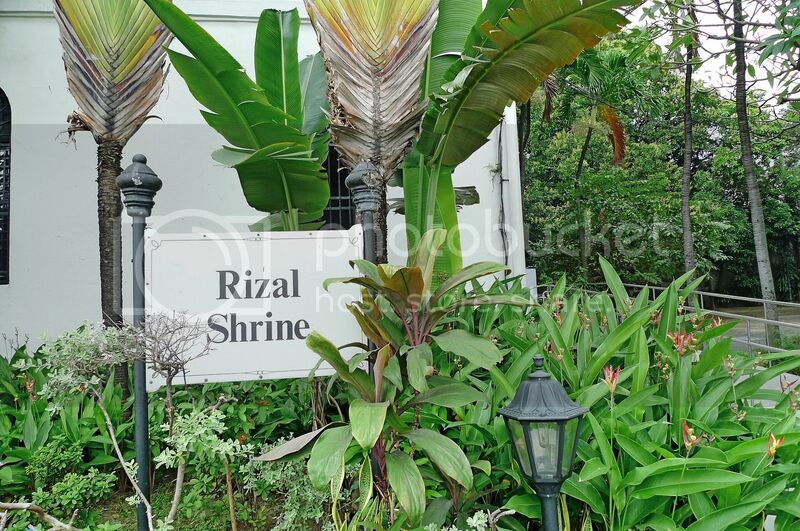 To honor his contribution to the Philippines, a national shrine was built from the ruins of the Spanish military barracks at Fort Santiago. Upon entering the Rizal Shrine, I saw quaint items on display in glass showcases. There were books, medical tools, photos and pieces of sculpture, mostly mementoes of the hero. 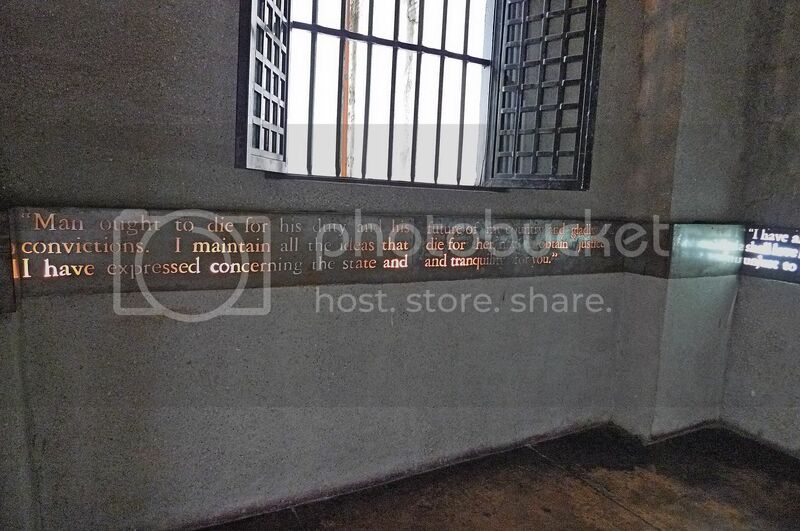 Next I reached the Contemplation Room and the Prison Cell of José Rizal. The prison cell was on the right side of the Contemplation Room. There were words etched onto the wood along the walls in the Contemplation Room. I was quite impressed by how the words seemed to glow by the lighting effect from within. 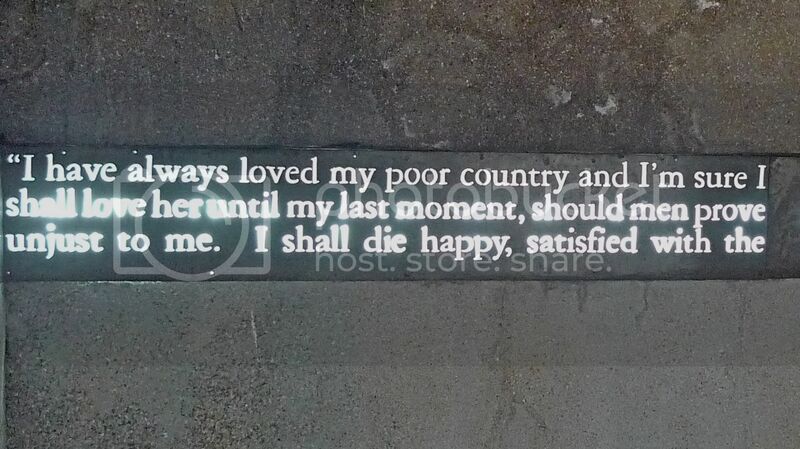 These were brave words coming from Rizal's sense of patriotism and his willingness to die for the liberty of his country. I did not take a photo of the prison cell as it was too dark. After that, I moved on to the Stairwell Gallery. 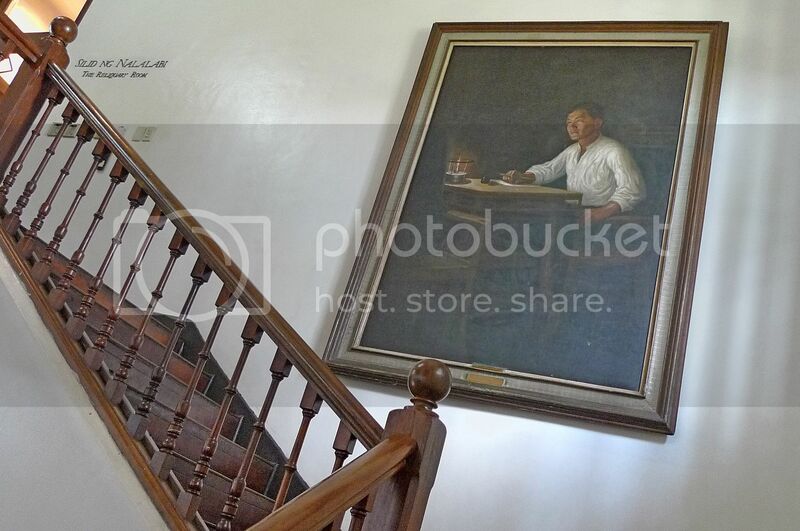 Climbing up the stairs, I saw this huge painting of José Rizal. 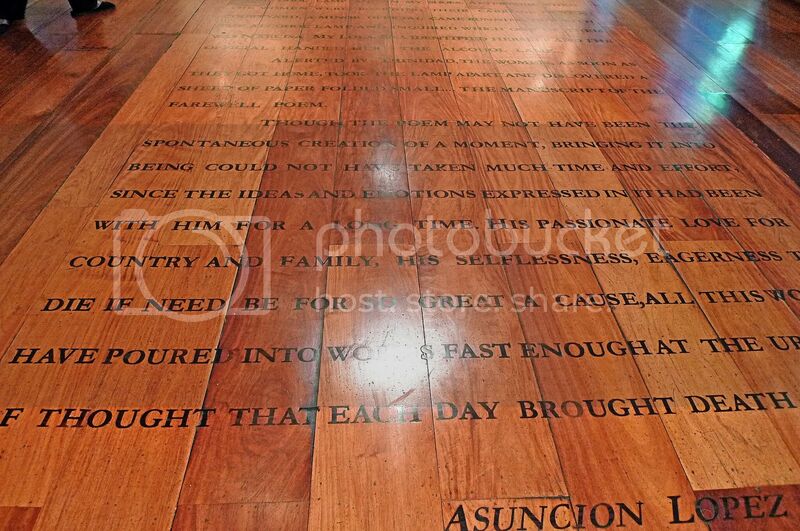 I entered a room where there were words on the wooden floor which sort of reminded me of the opening scene from Star Wars. José Rizal apparently wrote a farewell poem entitled Mi Ultimo Adios (My Final Farewell) on the eve of his execution. Read the poem HERE. The words on the floor seemed to explain how he wrote the poem and then hid it in a lamp to avoid being discovered by the Spanish authorities. Both the poem and the lamp were on display inside this room, but I forgot to take photos of them! I entered another room where I saw what appeared to be a piece of Rizal's vertebra displayed in a glass urn. This piece of vertebra was believed to be the part where the bullet from the firing squad hit Rizal during his execution on December 30, 1896. 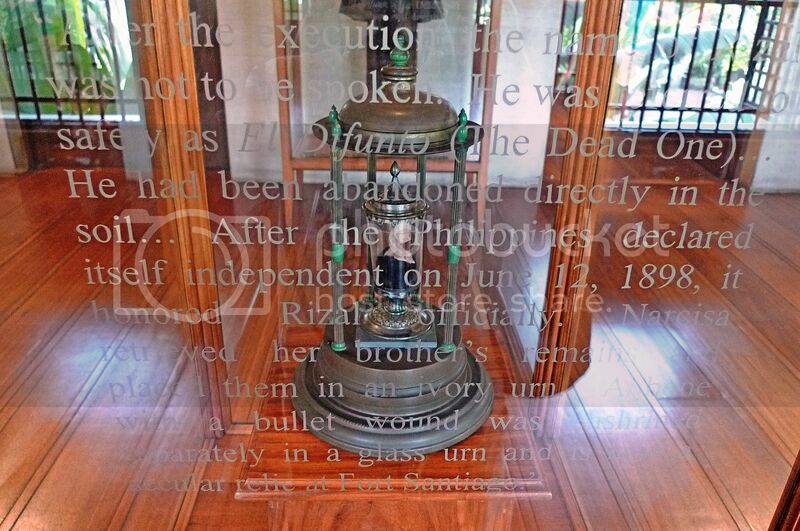 The words etched on the glass explained that Narcisa, Rizal's sister had retrieved his remains and his bone with the bullet still intact was enshrined in a glass urn and is now a secular relic at Fort Santiago. Having spent some time at the Rizal Shrine, I left through this walkway facing the golf course. 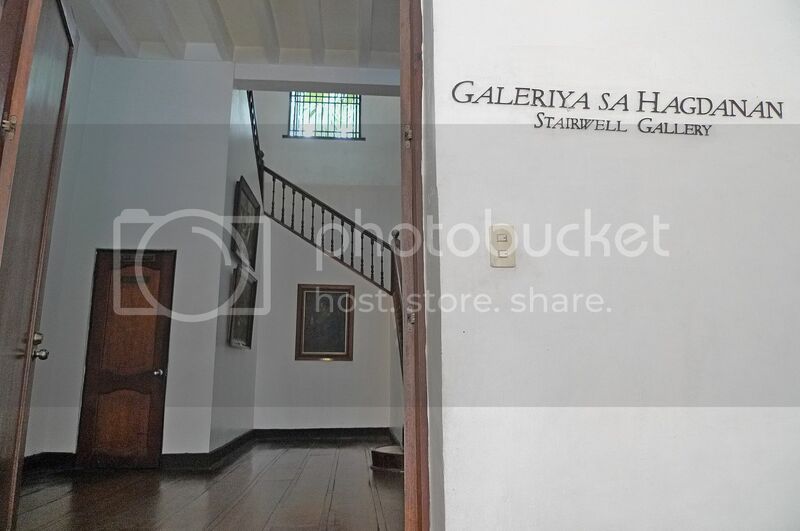 I reached Baluarte de Santa Barbara which houses the Rizaliana Furniture Exhibit but I did not go in to view the furnitures. 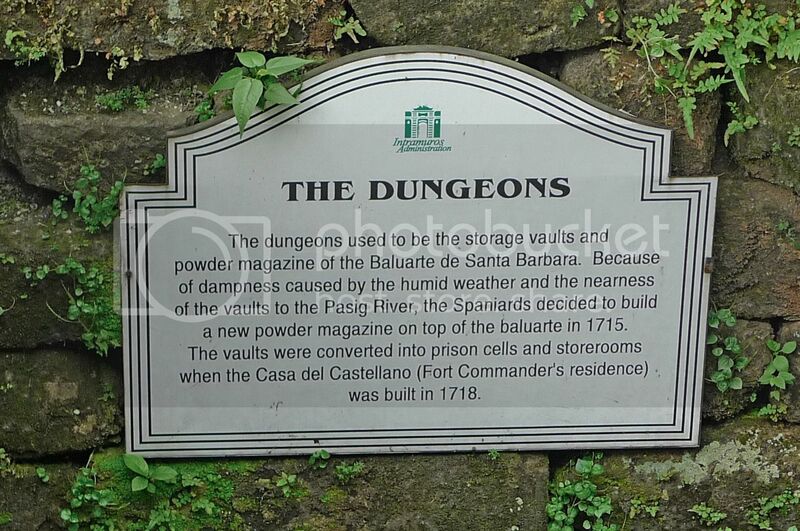 Instead I walked outside and saw what appeared to be old dungeons below where prisoners were tortured in the olden days. 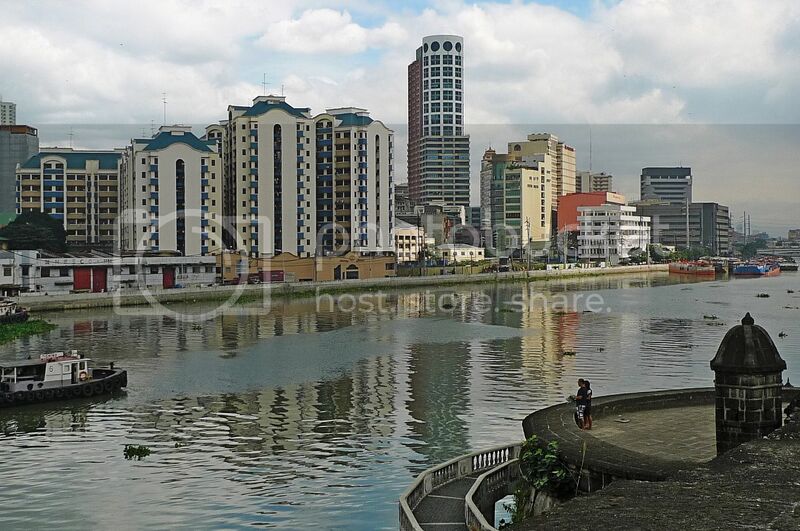 From here, I could see the Pasig River and Manila's Chinatown on the opposite side. I walked down to the lower ground and saw holes on the floor which were really dungeons in those days. There were a few places in Fort Santiago I did not really cover as I realised that I had already spent more than an hour here. I just remembered that my pedicab driver was still waiting for me outside! And then it suddenly dawned on me. How clever this pedicab driver was! He had brought me to Fort Santiago knowing fully well that I would be spending at least one hour here. One hour where he would be paid 100 pesos doing absolutely nothing! So here's what I learnt - if you plan to get a pedicab or a kalesa in Intromuros, make sure you visit Fort Santiago on your own first without engaging their services. 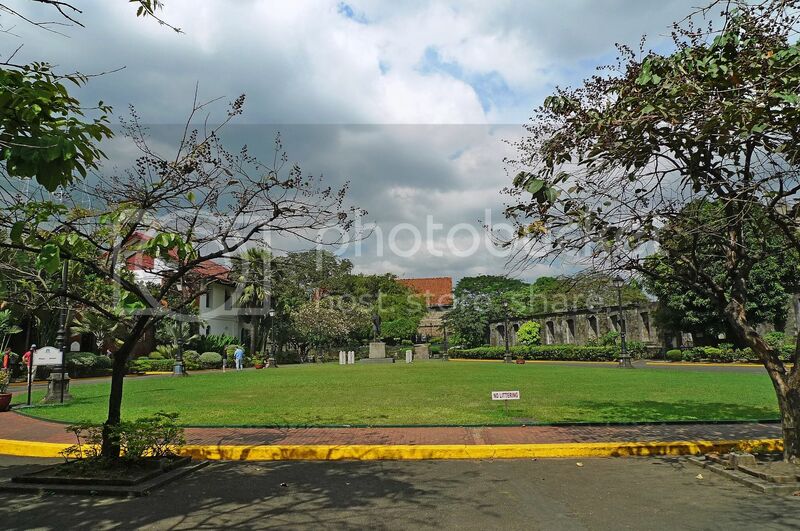 In fact, you should visit both Fort Santiago and Manila Cathedral on your own since they are not very far from each other and also because you will be spending most of your time in these two places. 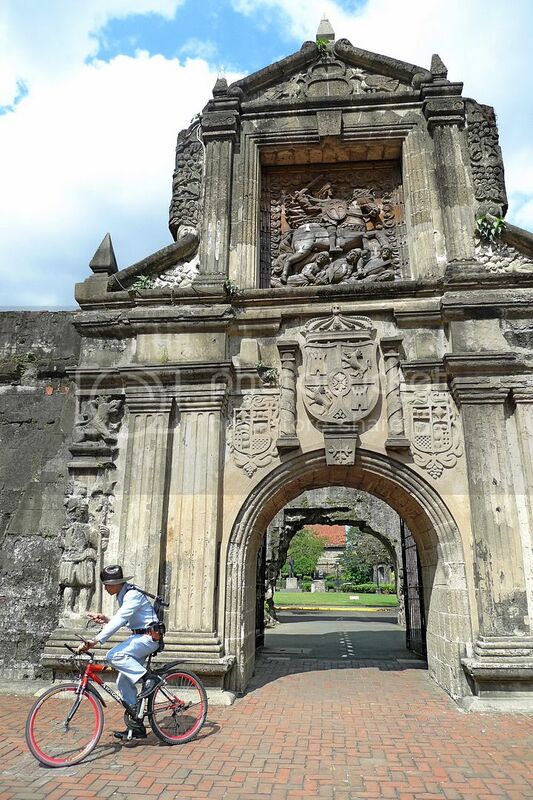 After that, by all means get a pedicab or kalesa to tour the rest of Intramuros if you do not wish to walk.